Ask anyone to name a famous music festival and you’ll almost certainly get Glastonbury back as a response. From humble beginnings way back in 1970, when it was known as the Pilton Festival and T Rex were headliners, Glastonbury has risen to become emblematic of music festivals the world over; an enduring symbol for generations past and present. Nowadays the festival sets the bar in terms of line up, prestige, scale and, as anyone who’s ever been will tell you, location. In fact the secret of Glastonbury’s success is in many ways due to its location. Set on the sprawling Somerset farm of Michael Evis (who has run the festival since its inception and is now somewhat of a celebrity himself), Glastonbury has something of the magical about it. Arthurian legends and myths abound amongst the ancient Stone Circles of this stunning Somerset valley and mingle with a frenetic melting pot of modern music culture to create a festival experience that really has no equal. Silver Stage has worked with Glastonbury for many years so having one of our largest structures become the main tent at the festival’s legendary dance music area has been a landmark for us as a company, giving us the opportunity to showcase one of our most jaw-dropping structures at the world’s most famous music festival. 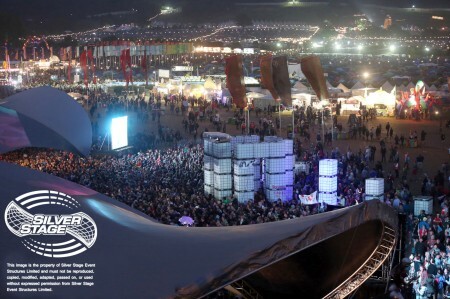 We always understood the epic potential for a 5V configuration of our S5 SaddleSpans and at the centre of Glastonbury’s new Silver Hayes dance area as the Sonic Stage, this was its time to shine. The S5 is an impressive site to behold but in a 5V formation it is truly herculean in stature. Fitted with a stylish silver skin, the S5000 5V configuration is a three pronged star when viewed from directly above. At ground level though you can immediately see how every side of this structure – bar the backstage – has been opened up to allow multiple entry points and stunning sightlines to the stage. By configuring the structure in a ‘V’ format, we were able to maximise crowd flow through the arena, whilst also increasing the amount of covered space in the event of rain (every Glastonbury goer’s greatest fear). The relationship we have with Glastonbury goes back as far as the 1990’s, when Silver Stage MD was working at the festival putting on his own motorbike stunt shows. Seth admitted this was a special achievement for him personally, as well as the company he founded. Silver Stage staff even got a shout out by BBC Radio stalwart Jo Whiley, during her live Radio 2 evening show, as she praised the work done by us and the numerous other contractors that contribute to staging the festival. So was the Sonic Stage a success? Well ask anyone that went to Glastonbury this summer and found themselves at Silver Hayes and you’ll be sure to get your answer. With acts like Nas, Disclosure, David Rodigan, Sub Focus, Aluna George and Rudimental all gracing the Sonic stage, Silver Hayes attracted huge crowds and was a roaring success. With plans to lift the S5000 5V even higher at next year’s festival, giving the crowds even better sightlines to the stage, as well as incorporating an even bigger sound system, you can expect the new Silver Hayes area to go from strength to strength. Memories of the music at Glastonbury Festival for those who were there will inevitably be intertwined with memories of countless tents, whole communities of people coming together, burger vans and bars, fields packed with people and the immense and visionary structures they found themselves in. With so many festival goers this year passing through the silver arches of the Sonic Stage to find themselves lost in another world, could it be that a Glastonbury legend has been born?